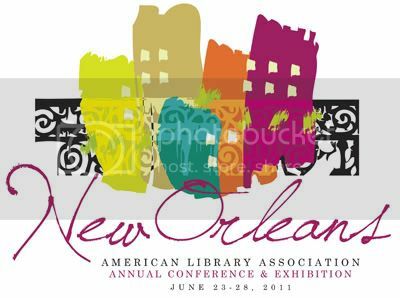 I had a grand time at the American Library Association Annual Conference, held this year in New Orleans. I took the train down from Atlanta which was a truly wonderful way to travel. So relaxing and so much less stressful than taking a plane. I got a lot of reading done on the train! How can I possibly explain the whole conference in one post? It's not possible! This is more of a light recap, rather than a true report of everything. I know it probably sounds like a lot, but there's so much that I know I'm leaving out! Saturday morning, I went to see Jeff Kinney, author of the Diary of a Wimpy Kid books. He was a mild-mannered yet funny speaker and talked about how he always wanted to be a newspaper cartoonist. He admitted that librarians scared him and joked that "reluctant reader" must be an educational term for "boys." Kinney said he liked keeping busy with his "day job" at poptropica, helping to create children's online video games. When asked how many Diary of a Wimpy Kid books he had planned he said that book six is coming out in the fall (obviously) and he's currently working on book seven. He said that he might want to do as many as ten books and he half-joked about running out of ideas. Kinney did say that he wanted to avoid the syndrome of adding more and more younger and cuter characters to keep things going (he cited Cousin Oliver from The Brady Bunch and new kids in later seasons of The Cosby Show as examples) which is why he decided to take things back to basics and have the Heffley family snowed-in for book six. Saturday night I went to a YA Book Bloggers meet-up and was finally able to put faces to names for Parajunkee, Green Bean Teen Queen, Gone with the Words, Kate from YA Highway, Abby (the) Librarian, and The Elliot Review, among others. The highlight of the evening (for me at least) was seeing some 60 and 70 year-old couples tear up the dance floor with some smooth salsa moves. I hope I'm half as cool and in love when I get to be that age. Sunday morning I went to the YA Coffee Klatch. It was so much bigger than I expected! It was held in a huge ballroom. How many people were there? I'm not sure, but it felt like hundreds. Just as everyone had warned me, the whole event went sooo fast. Even though we had nearly an hour, and five minutes with each author, it honestly felt like a blink of an eye and it was all over. Just a few highlights... I loved meeting Franny Billingsly. She talked about her new book, Chime, and how and why she had such a gap from her last book, the beautiful and lyrical Folk Keeper. What I loved about Billingsly is the way that she jumped between talking about her real life, and talking about stories she'd written... she'd be mentioning some family vignette and a moment later, she'd offhandedly refer to an elf lord. It sort of made your head spin, trying to keep up with her conversation, and what was "real" and what wasn't... she definitely seemed like someone who had one foot firmly in another world. I have to say, I felt terrible for author Joseph Lunievicz. His debut novel sounds like it's supposed to be a sober, gritty, coming-of-age story about an Errol Flynn obsessed boy in New York in the 1930's. I guess the cover kind of fits, but it just screams, "urban fantasy" to me, and I picture many readers throwing the book down in disgust once they learn there's no wizards, time-travel or enchanted swords to be had. Jamie Kennedy came by and gave us an spirited recap of his book The Order of Odd-Fish and his latest project The 90-second Newbery Festival. So many authors seem like natural-born storytellers, ready to spin a yarn, but others seem very shy... they write because they value their alone time. Brian Katcher, author of Almost Perfect seemed to be in the latter category. He told us that he wanted to write about a transgendered girl because he hadn't seen anything like it. He talked about how helpful being able to research this on the Internet was. Just like I've been told, the whole event ends so quickly, and of course, there's always an author or two that you wished you could have seen, but just missed. Just as the final bell rang, Cassandra Clare was one table over, and Cheryl Rainfield was another table over... we would have had the chance to hear either of them if there'd only been one more session. Aargh! I also went to the Newbery/Caldecott dinner, which was wonderful. School Library Journal was kind enough to offer me a spot at their table, and I had a great view of Erin Stead, the Caldecott winner, who gave a tearful and very humble speech, as well as Clare Vanderpool, author of the dark horse Newbery winner, Moon Over Manifest. Stead talked about e-books, and how a paper book will appear worn and loved after being read many times. She quoted The Velveteen Rabbit, about how being worn out will make something "real" ...maybe you had to be there, but it was a real tearjerker moment. Tomie dePaola won the Wilder Lifetime Achievement award and he gave a great speech, telling us at length how he got his first book published, and joked that he wouldn't describe the path to publication for each of his 200+ books in such detail. It was a really delightful evening, made all the better by hobnobbing with my former colleagues in California and Texas. This was a great conference: I'm inspired by all the new ideas that I picked up. I feel energized, invigorated and recharged! Sounds fun! Glad to hear about your adventure. I feel like I met more authors this year than I ever have before. Lots of authors were just meandering around, hobnobbing with the crowd... I've heard conflicting reports, but I guess it's just under 20,000 librarians who attended. It was really magical... I feel invigorated and excited to bring all these great ideas and experiences back to work. I agree, the authors did seem to be more a part of the general librarian crowd this year - which meant the danger of swooning when coming upon someone like Jonathan Stroud while staggering through the exhibits. It was so great chatting and imbibing after the Banquet - we LAPLers miss you! So lucky that you got to go! That's my home town which was hard to stay away from during ALA! Thanks, Eva! It was great seeing you guys... aw, you're making me homesick for ocean and palm trees already. I went ahead and unrepentingly went fangirl on plenty of authors this year (normally, I like to play it cool) and I'm happy to report that it went well. They seemed to appreciate my gushing incoherent praise and weren't too freaked out by me. @Book Sake - I made an effort to hit some local haunts in New Orleans, and I'm so glad that I did. Sure, I missed a panel or two... but I got to see a local marching band, and some wonderful street cafes, where I got caught in the rain. As well as a jazz cruise down the Mississippi River! Totally worthwhile.